Looking for the fastest way to apply a sealant to your car? 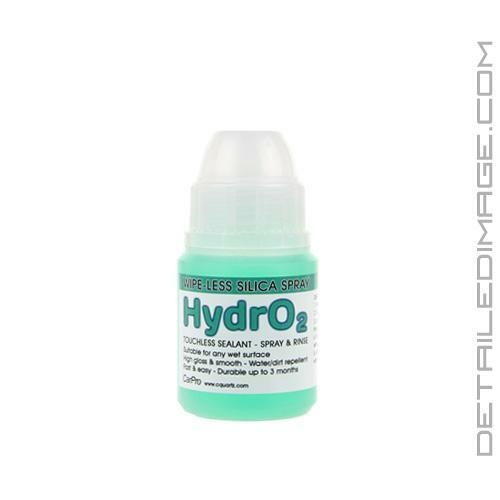 Get some HydrO2! The CarPro HydrO2 Wipe-Less Silica Spray Sealant will protect your paint with as little effort as, spray on, rinse off! HydrO2 is formulated with hydrophilic glass fibers, silicon polymers, and fluoropolymers, which allow this sealant to be applied to all vehicle surfaces (i.e. painted surfaces, glass, plastic, convertible tops, wheels, calipers, wheel wells, trim, headlights, etc.). After you have washed your car and it is contaminant free, leave it wet. You will want to dilute HydrO2, 1 part hydro to 3 parts water. You want a fine even mist, using the DI Chemical Resistant Spray Trigger I go panel by panel, spray a door and then rinse with a strong stream of water. Move to the next panel and repeat until you cover the entire car. Then simply dry the car and that’s it, you just sealed your car with Hydr02! So how does it work? It uses the process of hydrolysis, essentially it forms a bond with the surface through the addition of water. No one I know uses more HydrO2 than Joseph Torbati of Orinda Auto Detail and he was kind enough to share his experiences with the product below. Joseph said this about HydrO2: “What does this mean to you? No more wax on, wax off! Just spray on, rinse off! No more worrying about getting white residue on trim or around emblems that can be very stubborn to remove. This also is going to be the fastest way you can protect your investment with the least amount of effort.” Just to demonstrate how easy this is, Joseph made a video just for me! I like the idea on saving time. Can it be applied after polishing the car as well. Also, how long can it last? Would it be as long as wipe on wipe off paint sealants? If you plan on washing the vehicle after polishing, that is a great time to apply HydrO2. Do not apply HydrO2 to a dry surface, it must be wet. This product should last at least 2-3 months, however depending on the environment the car is in, durability may be greater than or less than the estimated range. A must have product in my opinion! Even if you prefer to use something else on your paint, Hydro2 is the quickest and easiest way to protect other areas like wheels, wheel wells, glass, convertible tops, etc. If you can spray it – you can seal it! I also use it regularly on top of coatings for additional protection. Very nice article on a great protect. This is something I have limited experience with, but look forward to using quite often as it begins to warm up. very nice. Sounds like something else I need to add to my ever growing detailing products. Thanks for the article and great information. Can you top this over carpro c quarts u.k? im sure you can but always good to ask a pro and be sure. I think I got some spotting from applying Hyrdro2 to wet panels, and rinsing off immediately after. Any idea why, or how to remove? 1.- You sprayed Hydro2 and let tiny bits of overspray float over other panels you didn’t rinse again. 4.- Surface was very recently waxed or sealed with old tech polymer products. Thanks Corey, I’m going to guess it was either 1 or 2 – both very possible. I will try your wet sponge method next time I wash. Thanks! Hydr02 is a must have product. It is the easiest product to use and durability is great for how easy it is. I recommend claying the vehicle first before applying for even better looks, slickness and durability. Expect roughly 3 months of protection and upwards of 6 on a garaged and well taken care of vehicle. Would it be ok to apply over 22ple coating? Is there any real benefit of doing this (gloss, etc?) or just overkill? Good question Tom – HydrO2 is a GREAT product to apply on top of 22ple! There are many benefits to topping your coating with a product like HydrO2 or Reload. The most notable reason is to provide even more protection and therefore maximize the durability of your coating. 22ple is already extremely glossy, therefore the increase in gloss would most likely be minimal if any. The reality of the matter is that HydrO2 is so quick and easy to use, there is no reason not to use it every couple of months for a bit of added protection on top of the coating. I am convinced, but application wise is it better rinse with a strong stream from a hose rather than a pressure washer?? Just wondering because Corey’s post said the pressure washer could have caused issues in the application. I have used this product on a couple of vehicles. One car sits out every day in South Carolina, care is minimal at best. A white Honda Civic. Washed with Dawn, applied Hydr02. Unbelievable the car was slick and shiney. I did not expect this at all, amazing. Other cars are my personal vehicles, a black Nissan Rogue 2014 and a red Mustang 2010. Results on these two amazing I really believe the results equal when I use Chemical Guys Black Light with thier glaze. Try it, you will not believe the feel or look. Never in the sun, one panel at a time! Spray on, hose off at once. Is this a specially designed spray sealant or is this merely good marketing? I have been using Hybrid V07 Spray Sealant on my cars with fantastic finish, I really love the final touch a spray sealant/wax can put on a vehicle. What I’m wondering though is will V07 with a water application like the Hydr02 produce the same results? Or are they differently engineered products for different methods? My current spray method is simply panel by panel: light mist, and when its about to lose its sheen I wipe with a plush micro fiber. Will I see increased results with Hydr02, or is it simply a different product for different needs. How would you describe where Hydr02 out-classes Hybrid V07, or vise versa. Say w/ the 50ml bottle mixed accordingly, how many cars can you do out of that? We’ll say a Mazda3 to make it easy? Certainly don’t want to buy it to for $20 to save me the time of waxing a customer car normally if I can only get 1 car out of that bottle, if that makes sense. Can you apply product to a waxed car or does all wax need to be removed. I have meguires 2.0 tech wax. You guys are the best! Between the discounts, customer service, products you stock, fast processing, and quick shipping! Thanks!